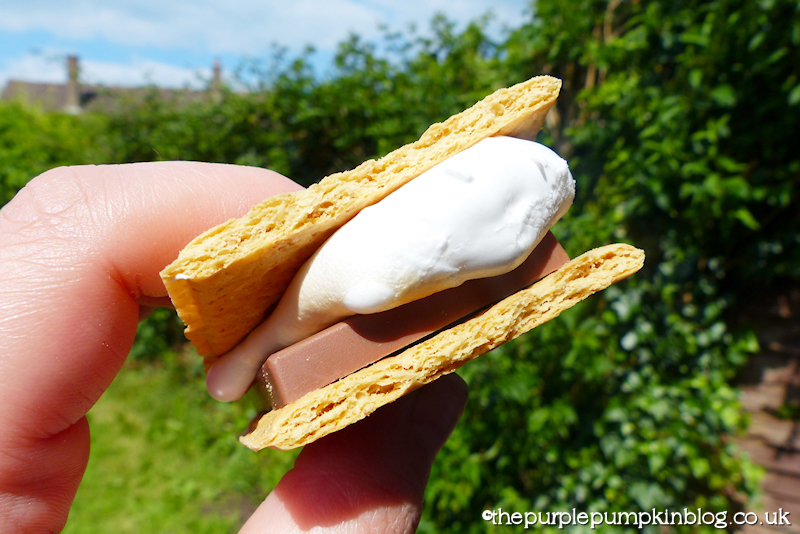 A s’more is a traditional campfire treat popular in the USA and Canada…they are a gooey, melty sweet treat made with a roasted marshmallow and a piece of chocolate sandwiched between two grahams crackers. Grahams crackers are an over the pond biscuit which we [sadly] can’t can buy here in the UK – hubs has just informed me, he saw them in our local Tesco! I have got a box which I bought in the USA, they’re kind of soft and have a subtle sweet taste to them. They are also long and can be broken into two or four pieces. I think a digestive or a rich tea biscuit would also work, so fear not – you can still make s’mores the next time you are round an open fire! Give each person two biscuits and a cube of chocolate. Place the cube of chocolate onto one of the biscuits. 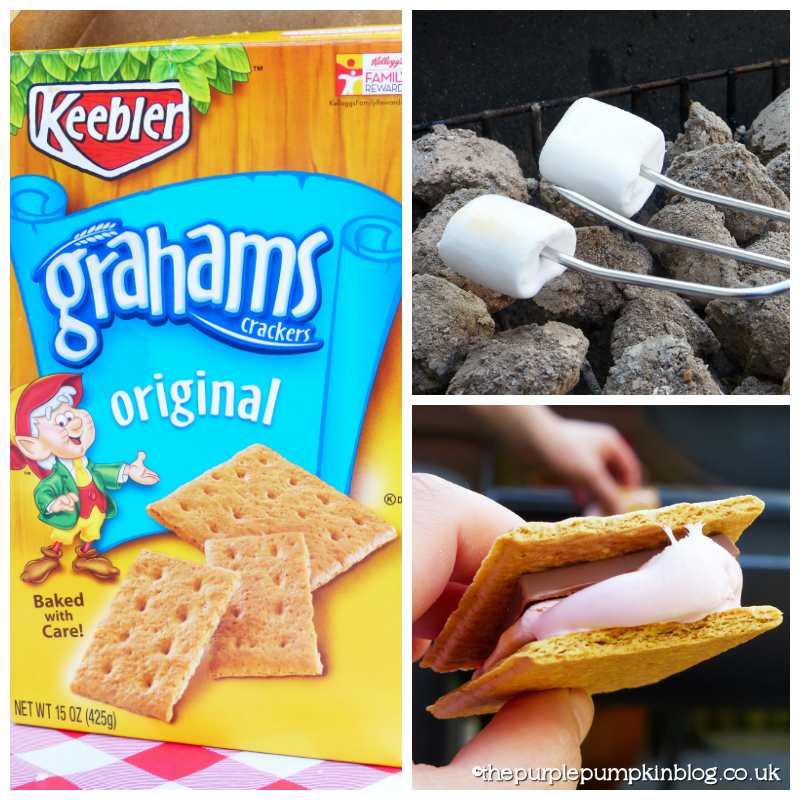 Using a skewer, roast a marshmallow over hot coals, a campfire, or even a gas hob if you have to! When the marshmallow is toasted and melty, place it on the chocolate, put the other biscuit on top and pull out the skewer, sandwiching it between the layers. Eat it, then make another one! The reason they’re called s’mores is because it’s short for some more! Grahams crackers are on my food shopping list for when we’re back in the USA this summer – need to replenish the dwindling stock!! 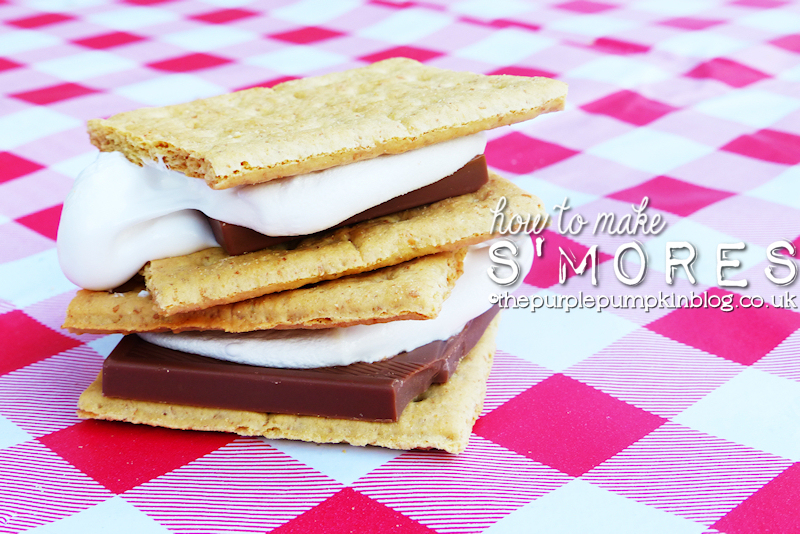 I hope you have a go at making s’mores – they make a tasty end-of-barbecue treat! YUM!!! I have seen a few people blogging about making these…I need to give them a try!